Hurricane Frances was the sixth tropical storm, fourth hurricane, and third major hurricane of the 2004 Atlantic hurricane season. Frances was one of the four hurricanes to have a major impact of the U.S. state of Florida in 2004. Frances made landfall near the same location Hurricane Jeanne would make landfall in about two weeks later. Frances caused about 101 tornadoes from Florida to Virginia. Frances left 49 deaths and $12 billion in damage. 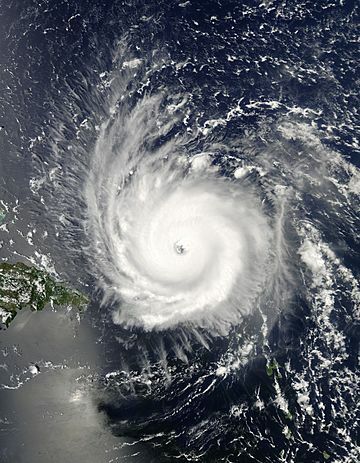 Because of the damage it caused in the United States, the name Frances was retired in the spring of 2005 by the World Meteorological Organization, and will never again be used for an Atlantic hurricane. In 2010 the name Fiona is on the list instead. Radar mosaic of Hurricane Frances at 12:57 am EDT, 5 September 2004. 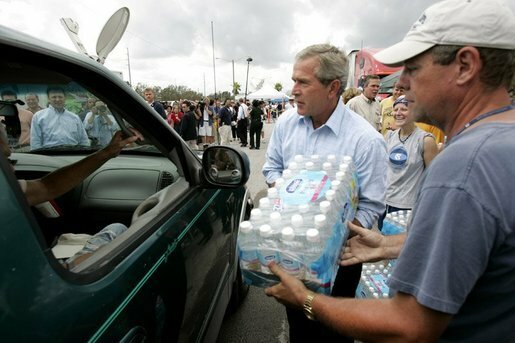 President George W. Bush helps deliver water at a relief center in Ft. Pierce, Florida. Hurricane Frances Facts for Kids. Kiddle Encyclopedia.